World No Tobacco Day – are you free to choose? The World Health Organisation (WHO), made up of unelected well-paid bureaucrats, and the SA government are determined to protect you from yourself whether you want them to or not. Today, 31 May, is World No Tobacco Day (WNTD), and government reminds you that ‘we know best’ about how to protect ignorant and selfish people from fulfilling their freedom of choice to smoke. FMF agrees that it is right that government inform and educate citizens about the health dangers of smoking. 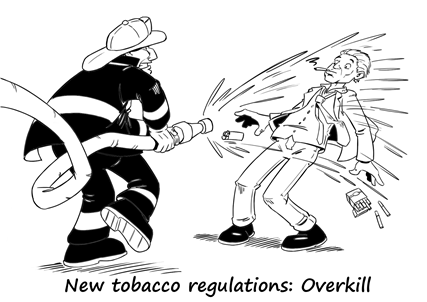 It is wrong, however, to pass laws to force adults to stop smoking that not only violate freedom of choice but damage small, especially township business. The Control of Tobacco Products and Electronic Delivery Systems Bill (the Tobacco Bill) in South Africa will do this and more. It is dangerous not only in the precedent set but in creating laws which cannot be enforced, undermining all laws by creating contempt for the rule of law, and interfering with legitimate commercial trade. It does not stop in public places. Government is now invading your private home with its zealous drive to stop you inhaling tobacco. From nanny state to baby sitter, the Bill bans smoking in homes where a domestic worker is employed. Regardless of whether the employee works only one half-day a week, smoking will be prohibited. The effect could be catastrophic if many decide smoking is preferable to domestic help. Potentially thousands of domestic jobs, which often provide the only family income, could be lost. The Bill introduces plain packaging. Your favourite brand will exclude all branding but will carry, like all others, horrific graphic images of diseased body parts and decay. This, government believes, will deter you from buying cigarettes. You decide. Plain packaging infringes on the rights of business to market and differentiate themselves from the competition; more importantly, it prevents new entrants into the market from becoming known. It violates the right to choose one’s own profession or trade as contained in section 22 of the Constitution. In 2013, Australia became the first country to fully implement plain packaging by denying all trademark usage for tobacco products. The policy sought to reduce the appeal of tobacco to discourage people from smoking. Instead, the Australian government’s own report notes that the two-decade steady decline which preceded plain packaging, stopped. And the share of illicit tobacco consumption grew from 11.5% to 14%. Illegal tobacco trade is a serious problem for South Africa not least in lost tax revenues. The Bill essentially bans indoor smoking in segregated areas. In a national drive to curb second hand smoke, the Department of Health forced businesses, at great expense, to build “smoking areas” segregated from the rest of the establishment. It now seems that was a waste of time and money in more unnecessary red tape for business. Maybe organised business should consider suing government for forcing wasteful and fruitless expenditure? The Bill also proposes to regulate e-cigarettes and vaping devices because they “may” be dangerous. This Bill is a nanny state on steroids. You may not agree with smoking – but what happens when they come after something you do enjoy? Freedom is not divisible. There are no half measures. Once the right to choose for oneself is given up, there is no return.